The amount of alternative capital in the reinsurance industry has risen by 10% during the first-half of 2017 to close in on the magic $90 billion figure, with the abundance of ILS capacity helping to stimulate record catastrophe bond issuance and a new market high, according to the latest report from Aon Securities. Alternative capital in reinsurance is measured as $88.8 billion at June 30th 2017, a 10% increase since the end of 2016. This means that alternative capital now represents 15% of the global reinsurance market, according to Aon Securities numbers. 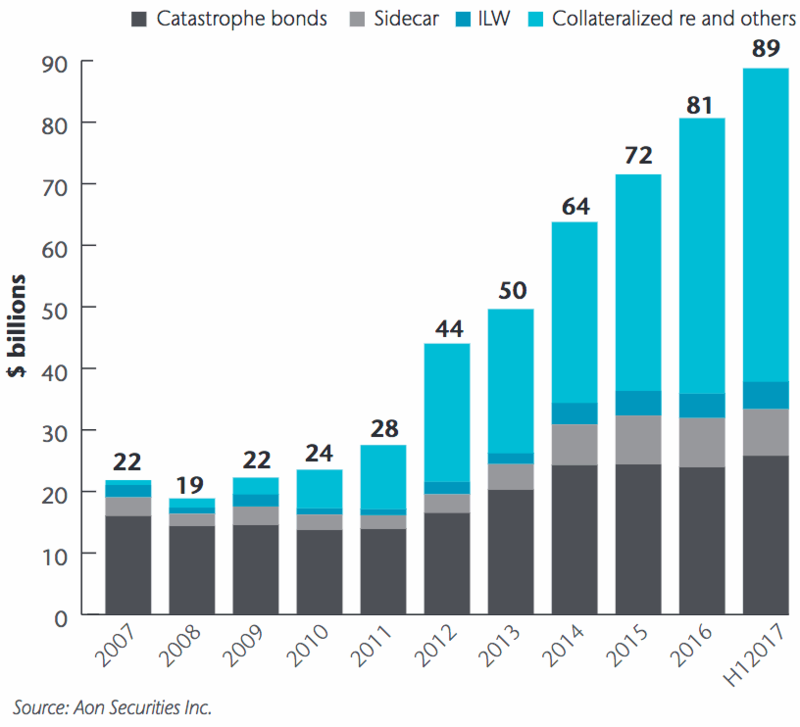 The continued expansion of the ILS market and alternative reinsurance capital from institutional investors has helped to spur on growth in the catastrophe bond market, with Aon Securities recording a record $11.3 billion in the 12 months to the 30th June. This falls a little behind the new record we revealed recently, with $13.5 billion issued in the 12 months to the 31st August 2017, which reflects the continued activity in the market. Aon Securities also reports the outstanding cat bond market at a new record high of $25.8 billion at the end of June. Investor and sponsor dynamics, spurred on by the availability of capital, the appetite for risk and new low pricing boundaries, all contributed to the record activity. Repeat cat bond sponsors renewed maturing bonds at a significant upsize of coverage, Aon Securities explains, while investors seeking favorable investments helped to drive up issuance sizes during the year to 30th June. The phrase “investor support” is used repeatedly in the Aon Securities report, recognising the significance of investors efforts to work with brokers, structurers and sponsors, to execute cat bond transactions at very favourable terms. “The 12-month period in review is most noted for the impressive investor support that enabled the high transaction volumes,” the report explains. The report also says, “investor support allowed the market to expand in size,” as issuance outpaced even the very high levels of maturities in the first-half of this year. It’s good to see investor support for market growth being acknowledged, as the investor-base and ILS fund managers have played a very important role in growing the ILS and alternative reinsurance capital market over recent years. The capital markets role in reinsurance is set to grow and catastrophe bonds set to remain a major component of ILS market activity. You can access the full report from Aon Securities here. Our latest cat bond market report, ‘Q2 2017 Cat Bond & ILS Market Report – First double-digit year ahead, $10 billion imminent’, provides much more insight into the record level of issuance seen in the second-quarter, while our range of catastrophe bond market charts and data visualisations allow you to analyse the outstanding market in more detail. Don’t forget to check out our Cat Bond Market Dashboard as well, for a snapshot of the ILS market. Note: Artemis’ data on catastrophe bond issuance includes every private transaction we can source information on, as well as full 144A broadly marketed issues. Hence our figures are typically higher than those quoted by broker reports, but we feel this provides a more holistic look at market activity.